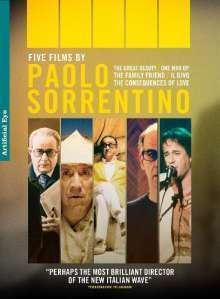 Der Artikel 5 Films By Paolo Sorrentino (UK-Import) wurde in den Warenkorb gelegt. Fünf Filme von Paolo Sorrentino, 549 Min. Acclaimed for his visual flair and sharp editing, Paolo Sorrentino is one of the most distinctive and stylish filmmakers to have emerged from Italian cinema in recent years. This collection of dazzling, gripping and master-fully constructed films, complemented by an extensive set of special features, serves as a stunning showcase of his finest work. At once a glorious ode to Roman brio and a scathing satire on Berlusconi’s Italy, this portrait of a jaded 65-year-old journalist (a career-best performance by Toni Servillo) haunted by lost love and a once- promising literary career has secured Sorrentino’s place in the pantheon of great Italian directors, alongside Fellini, Antonioni & Bertolucci..
A riveting tale of political intrigue and organised crime, based on the extraordinary and controversial life of former Italian Prime Minister Giulio Andreotti (Toni Servillo), whose long career was dogged by persistent accusations of conspiracy, Mafia underworld connections and state terror. Sorrentino’s effortlessly stylish, blackly comic and suspense-filled drama centres on a sleazy and misanthropic small-time loan shark, who becomes obsessed by the stunningly beautiful daughter of one of his clients.. This tightly plotted, stylishly executed and gripping psychological thriller probes the dark and terrible secret harboured by a mysterious middle-aged loner (Toni Servillo). Sorrentino’s assured debut feature about the dark side of fame charts the fall from grace of two public figures – a rock star and a football hero – who lead separate yet strangely parallel lives.